Time To Be Lean And Mean? Come and be part of the experience. On Saturday, September 12, 2015 the finalists in the 5th annual PM Paper Competition will face off in a judged event. Each team of university students will give a short presentation on a past high-profile project, extracting lessons learned that can be applied to future projects. The teams will then answer questions from the audience and judges about the project, the lessons, and how they came up with them. Responses from the teams will be judged along with the presentations. The winning teams will earn cash prizes. Morley Selver, PMAC's Director of Certification, would like to extend his congratulations to Gunjan Dua of Oakville, Ontario who achieved a score of 100% on the Certified Agile Project Manager exam on May 13, 2015 at the University of Toronto. Gunjan is only the fourth person to have ever received a perfect score on this exam. For a list of those who have earned the Cert.APM credential, please see our certification directory. Morley Selver, the Director of Certification, is pleased to announce PMAC's latest certification: the Certificate in Virtual Team Management. The Project Management Association of Canada was the proud sponsor of the spring 2014 IPMA Council of Delegates (CoD) meeting, in which delegates from approximately 60 countries came together in Toronto to discuss and vote on significant issues. The event was held downtown Toronto at the prestigious 1 King St. West hotel and conference centre. PMAC Past President Kevin Aguanno representing Canada at the international event, delegated by Alex Jalalian (PMAC's president). 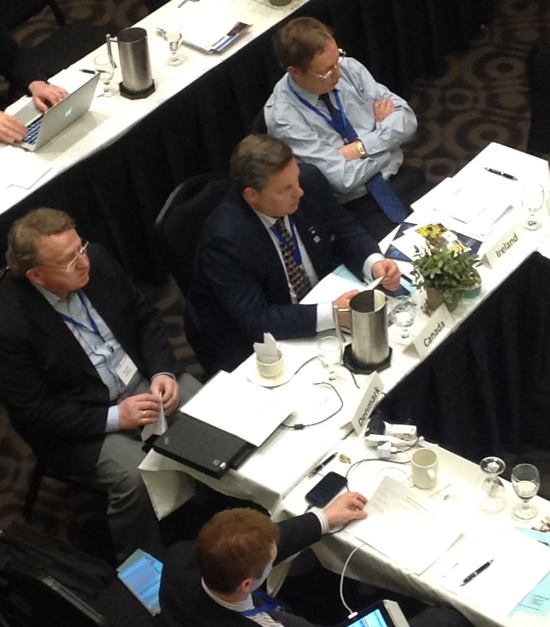 Many important issues were discussed and voted on at the CoD meeting including the admission of new country-level member associations into IPMA, and IPMA's strategic direction for the upcoming years. PMAC member Peter Milsom (IPMA Level-A) being presented with a certificate recognizing him as an accredited assessor for the new IPMA Delta organizational project management maturity programme. 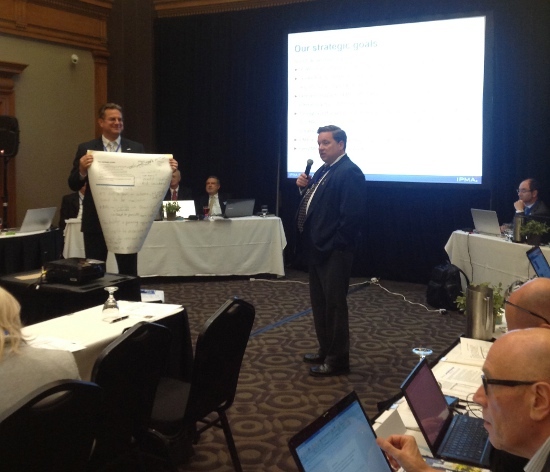 PMAC Past President Kevin Aguanno presenting the results of an IPMA strategy working session to the delegates. 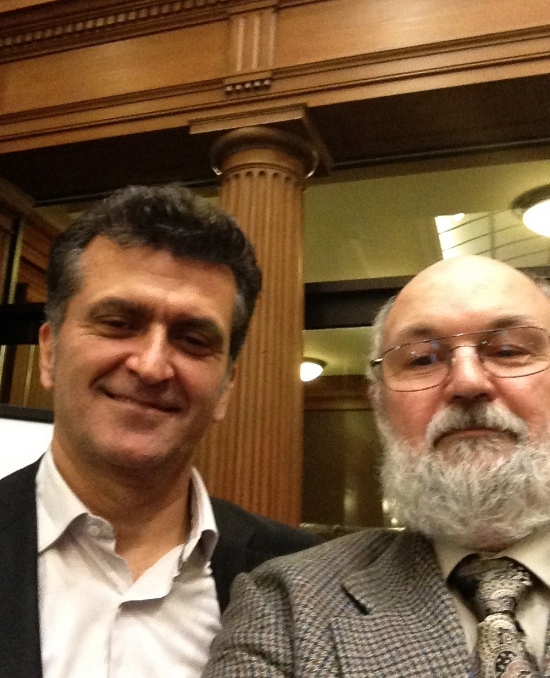 PMAC President Alex Jalalian and Director of Certification Morley Selver were also active at the event. Special thanks go out to Alex Jalalian and Lailee Ghorbani for their tireless efforts in organizing the event and making sure everything ran smoothly throughout the 6-day event. Their efforts raised the profile of PMAC within IPMA, and they made our association -- and our great country -- look good to the international community. Kevin Aguanno, Director of Awards and PMAC Fellow, would like to congratulate the winner of the 2013 PMAC Volunteer of the Year Award, Morley Selver. 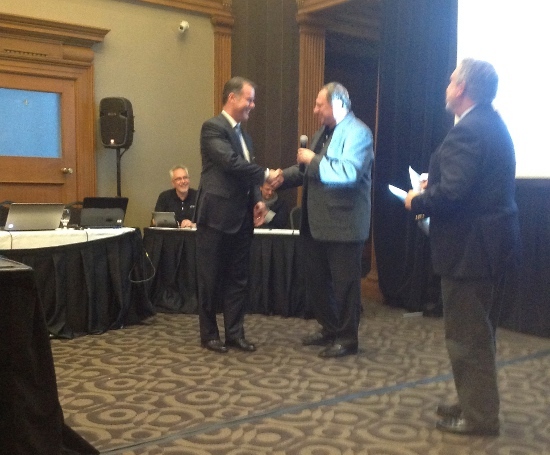 The award was unanimously approved by the attendees of the annual general meeting held in Toronto on 30 March 2014. Specifically, the award recognizes the extensive volunteer work contributed by Morley in his role as Director of Certification. In 2013, he single-handedly reorganized our certification systems documentation, created new forms, and updated our policies and processes to be compliant with the recommendations from the IPMA Certification Validation Management Board during our latest certification system validation. In addition, he has taken on the role of arranging and facilitating our Certification Board meetings, as well as the general PMAC Board meetings. Morley has actively followed up on certification and training inquiries from our current and potential members, and has demonstrated considerable leadership. PMAC has benefited greatly from his contributions and the 2013 PMAC Volunteer of the Year Award is just one small way of thanking him for his service to our community.